Brad is one of the hidden behind the scenes guy at TAP. Although you rarely see him his work is ever so present. Brad is the manager of the screen printing division and the production of the shop. He is the main spoke in the wheel that keep the shirts printing and orders getting produced. Brad started in the workforce in southern California where he started working as an automotive detailer. From there, he spent the next 5 years installing garage doors around the southern California area. After relocating to the Tri-State Area, Brad joined the TAP team. 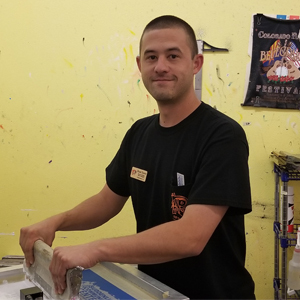 Brad is also an installer for the signs, graphics and wraps, as well as one of the production team members for the Wide Format and Small Format Division. When he is not at TAP, Brad is an avid golfer. He also enjoys fishing and spending time with his family.